Strong Families Blog: What would it look like if community supported breastfeeding mamas and babies? What would it look like if community supported breastfeeding mamas and babies? It is absolutely beautiful when a network of people is supportive of a mother and child who are breastfeeding. Not everyone is fortunate enough to have this type of network. If we lived in such a community, mothers would feel supported in their homes, workplaces, and in public. Breastfeeding support should take place before the baby is even born. The woman’s partner and/or family should be open to listening to her decision to breastfeed once the baby comes. When she knows others have her back and are determined to help her make it work, it can make a world of difference. This might mean reading up on breastfeeding together, talking to others who have or are currently breastfeeding, and being prepared with nursing items if needed. Family continues to play an integral supportive role as the baby grows bigger and continues to breastfeed. It’s important to dispel myths about breastfeeding such as the baby not being able to get enough nutrition off the breast alone. Ideas such as these can be hurtful to the mother and cause her a lot of stress because she is trying to defend the decision she knows is best for her and the baby. Attending breastfeeding classes together or calling the free breastfeeding hotlines can help with any issues or concerns. When the family foundation feels solid, mom can feel more confident in breastfeeding in public if she so chooses. In a supportive society, we would see mothers breastfeeding without shame and communities giving moms a pat on the back rather than escorting moms to the bathroom where they think it is more appropriate to feed an infant. Although breastfeeding in public was once a perfectly normal act in the United States and continues to be in other countries, it has now become stigmatized in this country. This is unacceptable, and we must be advocates for nursing mamas and babies. It can be a struggle to get job sites and schools to be breastfeeding-friendly. It is wonderful to know that there are many employers who provide clean and sanitary rooms for moms to pump their milk while on the job. Some even offer refrigerated storage. Even colleges are becoming more progressive and adding lactation sites around campus. High schools still need to catch up to support young mothers who need to either breastfeed and/or pump regularly for their babies. Although it is illegal in many states for employers to refuse a clean space for pumping, it continues to happen. It is even harder to get adequate breaks to pump as needed. It is our job as mothers and allies to stand up and say this isn’t OK. There are resources and guides on the Internet for employers to implement tips to become more breastfeeding friendly. Let a breastfeeding mother know she isn’t alone. 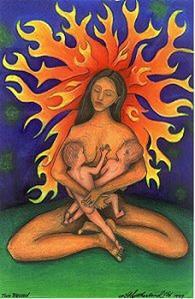 Even if you are not a mother or have never breastfed, let her know that you are an ally. Tell her she is doing a great job, offer to research breastfeeding and pumping laws in your state, and be on her side when she requests her rights at her place of employment. The more that others show breastfeeding mothers and babies their support, the more positive change we will start to see in society. Esperanza Dodge is a breastfeeding counselor and a mother of a four year old named Julián, and she has been a member of Young Women United in Albuquerque, New Mexico, for over 10 years.